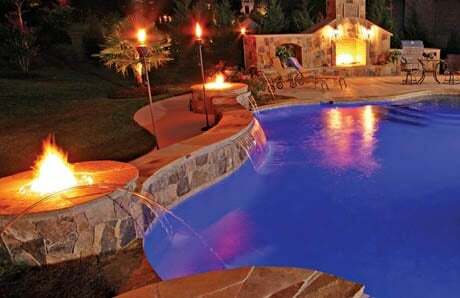 One or more fire pits near your swimming pool can be a great way to create both jaw-dropping aesthetics and practical, appealing comfort for you, your family, and guests. Nothing creates a cozy atmosphere like gathering around a fire. An open flame encourages everyone to pull up a chair and enjoy the heat and images of the dancing orange plumes. 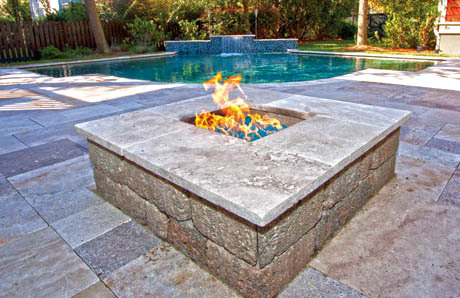 If you are building a new pool or putting in an outdoor living space, that’s a great time to include a fire pit. 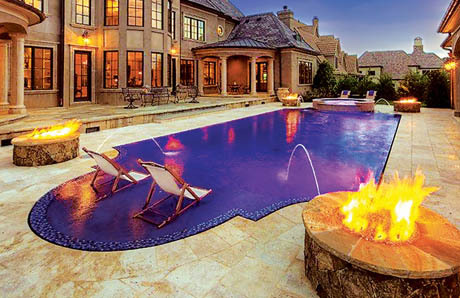 Fire pits are available in a spectrum of choices. You can buy one that’s a manufactured freestanding model; these come in a wide array of styles and at various price points. Or, you can have one that’s custom built to integrate with your deck, swimming pool, or other hardscape features. 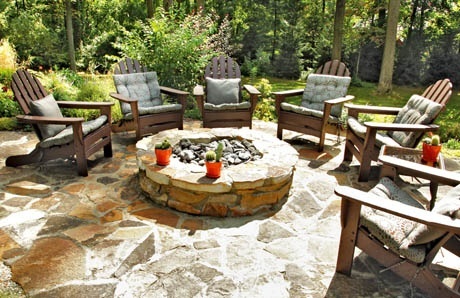 To foster sit-down gatherings around the crackling flames, fire pits are most commonly built or manufactured in a round shape, but they can also be made square or even rectangular. Typically they are 12” to 24” tall. 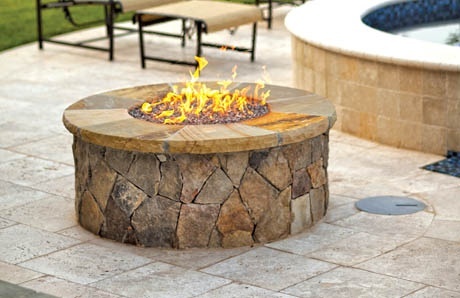 Styles run the gamut from rustic to modern, and many varieties of stone and veneer covering can be used to finish the fire pit’s exterior surface. 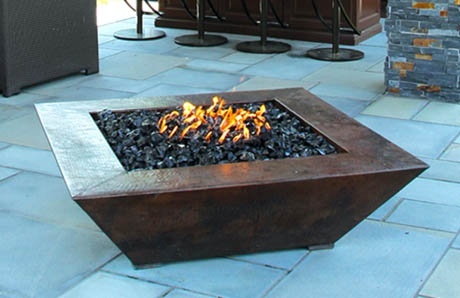 Because there are multiple ways to create a fire pit, they can easily fit into any kind of outdoor setting. 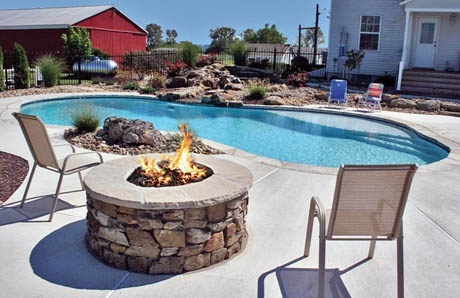 Let’s take a look at some fire pit photos from around the country that illustrate just some of the many options for fire pit features, materials, and functions. 1. To bring unity to the outdoor space, the side risers of this fire pit are faced with random-cut pieces of Eden Flagstone—the same material used for the coping around the swimming pool perimeter. Inside, red lava rock burns natural firewood. 2. This twin set of round pits seamlessly and dramatically integrates into the pool’s perimeter structure with a curvy wall (raised bond beam) that does double duty by providing seating. 3. Like many pits, this one has a natural gas line plumbed to it for creating fire without any wood. To enhance the visual effect and density of the gas-fueled plumes, the flames emit from both an interior and exterior metal fire ring. 4. With its square shape, oil rubbed bronze finish, and dark fire glass, this contemporary, freestanding, manufactured design blends in with both the rectangular-tile patio flooring and upscale outdoor kitchen. 5. Designed to blend with the rustic backyard surroundings, this installation features natural lava rock inside and is faced with the identical Mountain Fieldstone that is used in the pool deck. 6. A travertine lover’s backyard dream, this square pit is topped with the high-end stone to coordinate with the travertine deck. Blue fire glass inside the square opening completes the clean, modern design. 7. 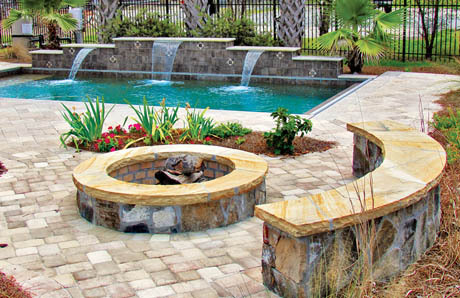 For visual elegance, a quartet of fire pits symmetrically accent the corners of this Roman pool; for user convenience, all four boast natural gas and a key valve to easily adjust the amount of flame. 8. To achieve a unified design and superb functionality, a custom “sitting wall” was built to match this fire pit, and both features coordinate visually with the same flagstone and stone veneer topping. 9. 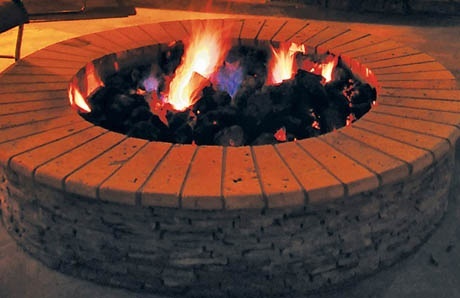 Built with comfort in mind, this fire pit boasts a 3-ft diameter opening for a large flame to create plenty of warmth, and it is topped with smooth bullnose brick, which has curved or “rolled” edges—vs. rough or straight ones that can sometimes scrape hands or snag clothing. 10. 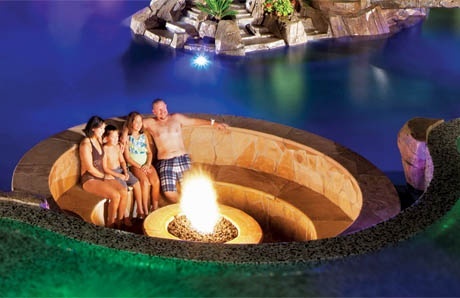 The truly ultimate setting for a fire pit is…inside of your swimming pool! This round, intimate seating area—known as a sunken conversation pit—is surrounded by water since it is built right into a luxurious private lagoon.